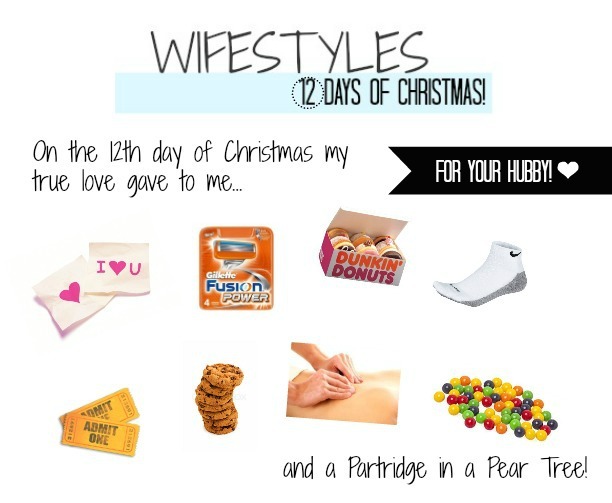 Wifestyles Blog & Photography: 12 Days Challenge! So, as the song goes... he will be receiving 12 days of gifts, special treatment and acknowledgement! My hubby has been so sweet and good to me this year that I think it's only fair that he gets 12 days of royal treatment! With that said, I've put some ideas together that are affordable, simple and fun! Day 1: An early Christmas gift is the first thing that comes to mind for me! This is probably going to be the most expensive gift out of the bunch! Any singular object will do! Think of something that he's been really wanting or asking for and make that wish come true! Day 2: Think double! What are things that come in pairs? Movie tickets, socks, his & her mugs, two scoops of his favorite ice cream... the list goes on and on! Day 3-6: Packages make the most sense! It seems like things always come in packs of 3, 4 and 6! My hubby is always in need of razors since he has to shave every day for work so that's a great thing that comes in a package of 6 for me to get him! You could also do packs of gum, candy, sporting items, drinks etc. Day 7-12: Think mushy gushy! Mushy gushy= cheap! Yet, it still shows them how much you really care! Bake 7 cookies, lead him on a scavenger hunt with 8, 9 or 10 love notes with a surprise at the end or buy him a dozen of his favorite donuts! If you don't have a lot of money to spend you can just show your hubby 12 days of kindness acts instead! Wash/clean his car, take out the trash or give him a massage! I hope you guys liked all of my ideas! I'm new at this so I'm just throwing things out there! Please let me know if you guys might try this too! love this I may have to start this myself!! aww, LOVE this!! I wanted to start something similar this year! You are too creative; I love this idea! I may do something similar too :) Oh the things we do for our cute husbands! Cute idea, Lauren. Who doesn't want early presents? This so sweet! Such a great idea. I did this last year and Twitch loved it so much- I'm planning to do it again this year! But in reverse. He said he would rather have the best present last so we are going to count down! You are a great wife! I'll have to keep this in mind if I ever get hitched! Such a cute idea! Or you could do it backwards and save the biggest and best present for last! I did something similar to this for my fiancé's birthday...I did a week full of gifts! I love this idea though, especially incorporating the numbers into each day! Such a cute idea! Can't wait to see what he thinks! Fun, I totally love this idea! I'm going to try it too!